Fourth of July is a time for family fun, picnics, and fireworks! And what a better place to watch a spectacular light show then on the Eastern Shore and Gulf Coast. 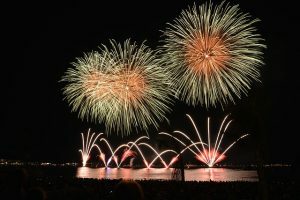 Whether you are a local or visiting our area the places listed below to see fireworks are all equally as beautiful and spectacular! Come early, grab a seat and sit back and watch the magic of the lights! The Marriott Grand Hotel will host their fireworks display on July 3, 2017, at 9:00 pm. Can you just see the lights dancing off the water? You don’t want to miss this show. The City of Fairhope will host a concert and fireworks display on July 4, 2017, at 7:00 pm. Come early and grab a seat on the lawn at Henry George Park and listen to the Baldwin Pops play before during and after the fireworks. This beautiful show can be seen from either side of the bay. The City of Gulf Shores will have a stunning fireworks display on July 4th, 2017, at 9:00 pm. Fireworks will be shot from the Gulf State Park Fishing and Education Pier. This show is sure to win the hearts of vacationers and locals! Independence Day Celebration at The Wharf on Monday, July 3, 2017, 8:45 pm. The Wharf at 4550 Main Street in Orang Beach will be a great spot to watch the fireworks show at 8:45 pm. Before the show, the main street will be lined with kids activities starting at 5:00 pm until 9:00 pm. Immediately following the fireworks, the festivities will continue with Spectra the Sound and Light Show. Enjoy your holiday weekend and if you want to see any real estate I am happy to help! Happy 4th of July! Dana LaRue is a licensed Realtor® at JWRE- Fairhope, a local company that specializes in all aspects of real estate on the Eastern Shore. Dana has prided herself in her passionate and heartfelt desire to serve her client's best interests. She is dedicated, knowledgeable and committed to finding the perfect fit, whether it's selling or buying an investment home, condo at the beach or a residential home for her clientele. Her devotion and unparalleled customer service have resulted in a continuously expanding network of loyal clients and referrals. Passionate about her craft, she continuously seeks ways to stay ahead of the game in market education and trends. An avid explorer of finding the perfect beach spot, she loves to try new restaurants, check out local festivals and run in 5k's. Contact Dana at 251.752.3663 or email Dana@LaRueGrp.com for your home buying or selling needs.